a 50% whole grain bread! Do you have a crust shot? We like this one a lot - something about the ancient grain. Since we got into spouted grain explorations I can't remember the last time we made some toadies. Will have to make some soon along with some red malt . Give 'em a crust shot and they demand a crumb shot. Give 'em a crumb shot and they demand crust shot. I cut this batch apart and froze three halves before snapping a crumb shot as the Taleggio was about to land on those slices. But if you insist, I'll try to remember to capture at least one of the half-loaves when it Comes In From The Cold (out of the freezer). Thanks for your comment, dab, and Happy Baking. P.S. That apprentice of yours sure has good taste (cf. her Breads of the Year). There's your crust shot, Mr Dab. Egged on by Josh, I went for 60% this week. No complaints. Post coming. Not sure I can get my hands on any einkorn. Think it adds any depth of its own at 10%? I am on a huge Hard White Wheat kick though. Good question. 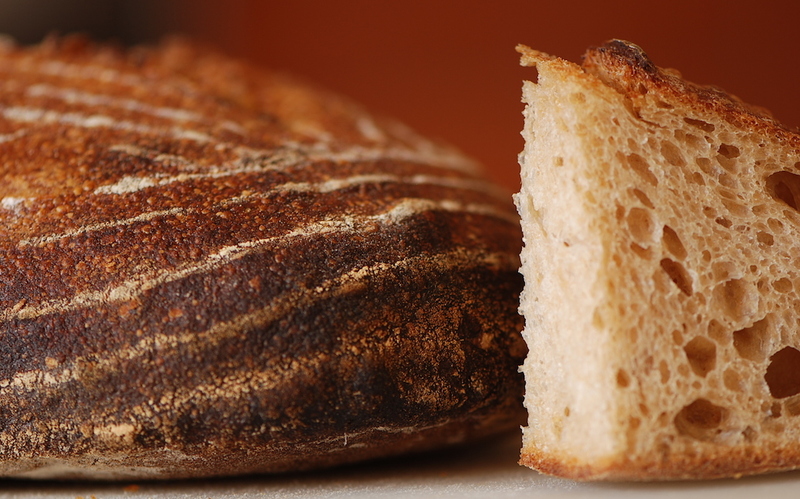 Yes, we can taste (and enjoy) the einkorn at 10% – any less would lose it. But context is critical: We eat vegetarian, so our home flavor palette is relatively subtle and sensitive compared to bolder carnivorous diets. More important is the 40% White Wheat 'in the background'. That amount of red wheat largely muffles the einkorn contribution. Hard white provides a relatively neutral, unintrusive platform against which to appreciate subtle alternatives such as 10% einkorn, other minor grains or recently, low Lovibond (<10˚L) commercially malted grains. ... I would love to see and hear about what you've been doing with hard white wheat as well. I'm sure you've done some impressive things. Very versatile 'platform'. And makes great pasta in 1:1 fresh milled mix with durum! Just curious as 10% is that fine line. Sometimes it's enough and sometimes it disappears. I'm just in the midst of pasta trials. I've had both good and bad results with pasta making. But I'd love to add it to my offerings as it would be a simple thing to do if and when I get it down. I use Kamut as I have the whole berries available local and it is an ancient Durum Wheat. In fact I intend to get back at this with the new mill capable of very soft fine flour. I also will be trying some testing with a portion of the flour pre-fermented. I've pretty much relied entirely on Red Wheat for most of my baking using White Wheat with my sweeter breads or breads with additions as to have less competition for flavor profile. But I've realized in doing so I may very well prefer the flavor of White Wheat. Red Wheat (yes this is a generalization as there are many varieties) comes off very assertive, almost chocolaty bitter, and one noted. Blending the two in place of just Red Wheat seems to soften that blow and make for a much cleaner/rounder flavor profile. In fact I'll be posting shortly a loaf I made this past weekend doing so and it was quite good. I've found White Wheat makes for a great tasting hamburger bun punched up with whole grains opposed to its very white, refined predecessor. Also White Wheat makes for fantastic tortillas. And these come together in an hour or so and I've got them at 50% Whole Grain. Totally agree: Below 10%, subtle additions like einkorn are lost to all but the most sensitive of palettes (e.g., my wife: incredibly sensitive. Keeps me on my toes). But raising these gluten-challenged alternatives above 10% threatens crumb structure in the hands of amateurs like me. I'm sure it's far less of a problem for your journeyman baker's chops, but I have to compromise formulae to accommodate my relatively modest skills. I haven't been impressed with Kamut, Emmer or Durum in that 10% slot, but then again I haven't tried them yet against the 40% hard white wheat background. On the (long) list though. Our fresh milled 50:50 Durum:White Wheat pasta is made with 1 egg and 50 ml milk per 150 gr flour. Mix, knead, rest >=1hr at room temp then run through machine. Rolls out fine all the way down to setting #1 but starts to tear at #0 (no need for that thin anyway). Have only made cannelloni and ravioli with it. Fabulous. Looking forward to seeing and reading about your grain combo explorations, as always. Not much experience with Emmer but the Kamut and Durum need to be pushed higher than 10% or they will be lost aside from maybe color. But I've had great success using up to 50% Kamut blended with White Flour. I'm sure it would make a fine 100% whole grain loaf blended with White Wheat. in fact that sounds like a nice idea. I think your bread skills are that of journeyman quality and you need not fret pushing the envelope. As long as the crumb is well aerated and relatively open then flavor rules. Push that einkorn. I've not used Einkorn myself but being a relative to spelt I'm sure it'll work just fine even upwards of 30%. Then you'll really grab hold of it's flavor. I'll give your pasta a shot but i may just use water opposed to milk. I'd want to make simple pasta like spaghetti, fettucini, or lasagna noodles. I'm also trying to convert my gnocchi to whole grain as well. And I'd really like to see what adding pre-fermented flour does. I'll probably make a batch side by side, one with, one without. Just for giggles you know.